Raumfahrt+Astronomie-Blog von CENAP - Blog: Raumfahrt - Kann ein supraleitendes Magnetsegel eine interstellare Sonde verlangsamen? According to Gros' calculations, what is needed is a magnetic sail in order to transfer the spacecraft's momentum to the interstellar gas. The sail consists of a large, superconducting loop with a diameter of about 50 kilometres. With a miniaturised space probe capable of being accelerated to a quarter of the speed of light, we could reach Alpha Centauri, our nearest star, in 20 to 50 years. However, without a mechanism to slow it down, the space probe could only collect data from the star and its planets as it zoomed past. A theoretical physicist at Goethe University Frankfurt has now examined whether interstellar spacecraft can be decelerated using "magnetic sails". For a long time, the idea of sending unmanned space probes through the depths of interstellar space to distant stars was purely utopian. Recent research on new concepts - amongst others within the "Breakthrough Starshot" project - has shown that miniaturised space probes could be accelerated by means of powerful lasers. Slowing them down again seems more challenging, since they cannot be fitted with braking systems for weight reasons. However, according to Professor Claudius Gros from the Institute for Theoretical Physics at Goethe University Frankfurt, it would be possible to decelerate at least comparatively slow space probes with the help of magnetic sails. "Slow would mean in this case a travel velocity of 1,000 kilometres per second, which is only 0.3 percent of the speed of light but nevertheless about 50 times faster than the Voyager spacecraft," explains Gros. A lossless current induced in this loop then creates a strong magnetic field. The ionised hydrogen in the interstellar medium is then reflected off the probe's magnetic field, slowing it down gradually. This concept works, as Gros was able to show, despite the extremely low particle density of interstellar space (0.005 to 0.1 particles per cubic centimetre). Gros' research shows that magnetic sails can decelerate 'slow' spacecraft weighing up to 1,500 kilograms. 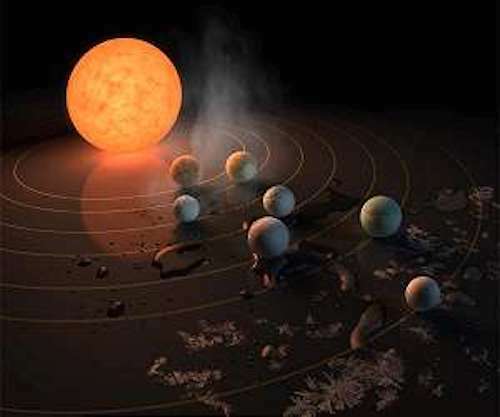 However, the journey would take historical periods of time, for example about 12,000 years to reach the seven known planets of the TRAPPIST-1 system. Surprisingly, slower cruising probes the size of a car could be launched by the same laser which would make it possible to send, according to current planning, high-speed space probes weighing just a few grams to Alpha Centauri. Missions to distant stars that would take thousands of years are out of the question for exploratory missions. But the situation is quite different in cases where cruising time is irrelevant, such as missions that open up alternative possibilities for terrestrial life. Such missions, like Gros proposed in 2016 under the name of 'The Genesis Project', would carry single-celled organisms, either as deep-frozen spores or encoded in a miniaturised gene laboratory. For a Genesis probe, it is not the time of arrival which is important, but the possibility to decelerate and then orbit the target planet.